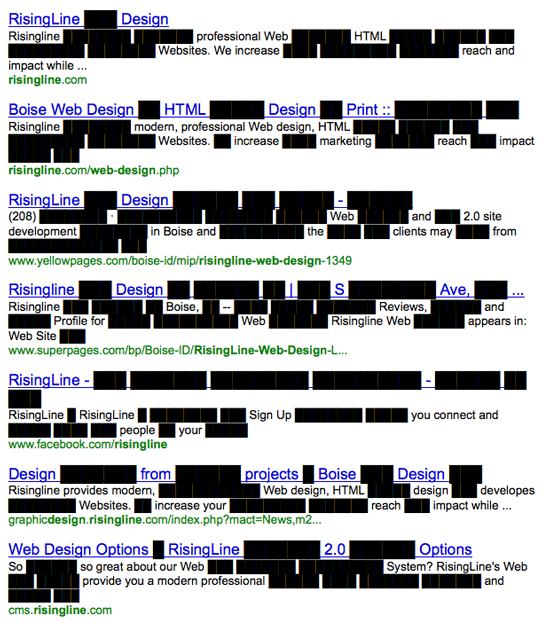 Do you want searches for your business Web site to look like this? As you probably heard heard, the Stop Online Privacy Act (SOPA) and Protect-IP Act (PIPA) are two bills racing through Congress that may result in unprecedented regulation and censorship of the Internet. You need to know that this is a major business concern, for small and large companies alike. It has nothing to do with your political persuasion and should not be confused with any other popular movements such as Occupy Wall Street. As a manager or owner of a business Website you need to quickly educate yourself on how these bills if passed into law could adversely affect your business and then take action by letting your opinion be known. Corporations on record as opposing these bills include American Express, AOL, Cragslist, Discover, eBay, Facebook, Google, Mozilla, PayPal, Twitter and many more. Please visit this Website to quickly and easily take action and let your opinion be known to the decision makers.